When Peralta Design decided to open their Florida office, we were excited for them and for ourselves. We knew from the start that this partnership would foster a unique relationship in that both companies believe in a modern approach to business, design thinking, and the power of collaboration. Ramon Peralta, Founder and Creative Director, leads his team to serve Connecticut to Florida seamlessly. With their passionate attitude about startups, design, and branding, anything is possible for their clients. Peralta Design could have opened an office in Flagler County by themselves. But they did not. They opened within our business cluster in 2015 because they understand the value of a village. Harvard Business Review talks about Clusters and the New Economics of Competition, offering complementarities can make buying from a cluster more attractive. As part of doing business, Office Divvy provides referrals and connects member to members, and members to clients. Office Divvy has provided over 900 business referrals since it’s inception in 2008. Peralta Design makes it easy to refer business to them. They listen, respond professionally, and follow through. Office Divvy and Peralta Design combine forces when a business needs a number of things to get started or to scale. With our shared love for startups, skill-sets between our companies are immensely complementary. This is what creates the dynamic coalition that Office Divvy and Peralta Design possess. We wanted to develop a video to tell the story of that dynamic coalition. Peralta took the lead with their in-house video services. We thought it was a great way to also showcase the power of an “Explainer Video”. Ever since Peralta Design’s warm-welcome in Palm Coast at their launch party, they have served not only our Flagler community but Florida as well. 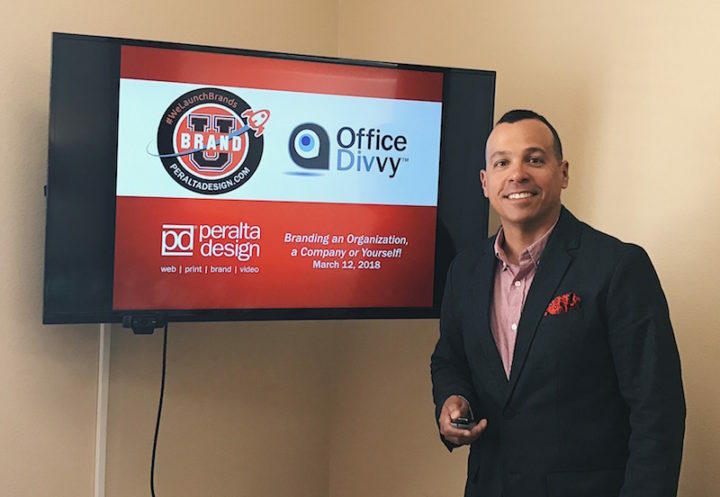 Recently, a Lunch n’ Learn titled “BrandU” was presented by Ramon Peralta. It was held right here at Office Divvy and it covered all the ins and outs of branding. This included the actionable steps to take when branding or rebranding your company, business, organization, or even yourself. The logo is only the tip of the iceberg. Branding is everything that falls below what is seen. Examples include: differentiators, digital footprint, customer experience, and company values. Brands that are disruptive are brands that stand out. Peralta Design invites you to have them Grade Your Site. Request a report card and The Peralta Design Team will analyze your website for free. They’ll look at layout and usability of your website on different devices and screen sizes. Naturally, SEO (Search Engine Optimization) analysis is part of that. This is where you learn how well your website interacts with search engines. If you think you would benefit from meeting with Ramon, Lisa and Ky, give us a call (386-246-8590) so we can set that up. Kaitlin is a student now and for life. She is passionate about design and content creation. As a lifetime learner, she is always searching for ways to broaden her mind. Where do you go when you really need to get work done?